Buffalo Chicken Salad (sort of) with Goat Cheese Dressing – Elly Says Opa! I have moments where I definitely question my foodie status. I hope I’m not shunned from the food community by mentioning these moments, but a few include a preference for milk chocolate over dark (though I like both), liking truffles enough but not being blown away by them, hating cilantro except in incredibly small doses, and not eating blue cheeses. Are you still with me? Phew. I guess it goes without saying that I don’t really like blue cheese dressing. Buffalo chicken salads usually come with blue cheese dressing (or the occasional ranch) so I never really order them in a restaurant. But, I was thinking that with the little leftover goat cheese & buttermilk I had in my fridge, I could take the concept of blue cheese dressing and apply it to a goat cheese dressing. If you’ve read my blog at all, you know I have a major love of the goat cheese. Now, a lot of blue cheese dressings are made with mayo, which I also despise. I decided to use some Greek yogurt instead. It’s still creamy but it’s better on my palate, and healthier, too. Besides the fact that I made goat cheese dressing insead of blue cheese, the reason I say “sort of” in my post title is because I think a buffalo chicken salad usually has things like carrots & celery and not much else, besides lettuce. I did use celery (no carrots), but I also used tomatoes and cucumbers. Making buffalo sauce is incredibly easy. It’s just a mixture of a red pepper sauce (like Frank’s) and butter. The most common ratio seems to be 1:1 but I like spice (and, conveniently, am not that crazy about saturated fats) so I use more like a 2:1 or even 3:1 ratio. It’s really your preference. You just need to heat those two ingredients to your liking in a small saucepan and then just slather on the cooked chicken (which, in this case, was seasoned very minimally with salt & pepper and just cooked stove-top with a little oil). This was great! 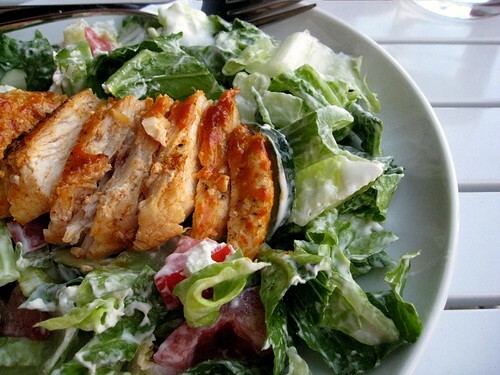 The cool, creamy, slightly tangy dressing paired well with the spicy buffalo chicken. Plus, I am all about minimal cooking in the summer. Combine all ingredients with a fork, breaking up the goat cheese to mix it in.